Prime Minister Binyamin Netanyahu visited the southern Arava region Sunday, to see from up close the start of construction of the security fence along Israel's eastern border. Netanyahu sounded an urgent tone, calling for the speedy construction of the fence, preferably ahead of schedule, and promised that he would be back at the site in three months' time to check up on the progress of construction. 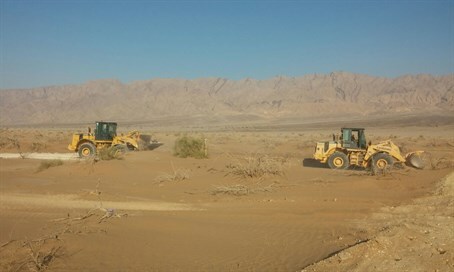 The first section of fence being built will stretch 30 kilometers, from Eilat to the Holot Samar area, north of Timna. "We are starting, today, the construction of the security fence on our eastern border, which is a continuation of the security fences that we built along the fence with Egypt, and which will eventually connect with the security fence that we built in the Golan Heights,” Netanyahu said. "We are seeing today what happens to states that lose control of their borders,” he said, in a clear allusion to the influx of refugees and migrants into Europe.